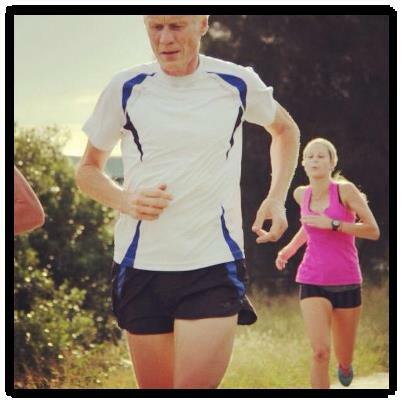 Keith Bateman – a 57 year old runner who keeps getting faster! Keith clocked his 10km PB in 2011, and holds World Records (55+) for the 1500m, Mile, 3000m, 5000m and 10000m. I now feel i need to seek the advice of a technique coach, nutritionist, trainer, biomechanic…. the list is growing. As most of the panelists from Friday night turned up to run Parkrun on Saturday morning, and the weather was nice and cool, I thought some Parkrun records might be under threat. I got off to a quick start in the first km as I usually do. At the 1km mark I looked up to see Sonia O’Sullivan, Reggie Wright and Dave ‘Robbo’ Robertson cruising along and having a chat in front of me. Keith Bateman and Alan McCloskey were also nearby, that was 3 out of 5 of last nights panelists. For the next few km I just tried to keep up with these guys and listen to the conversation, hoping I might learn something. With about 1km to go, I actually looked at my garmin for the first time and realized how quick I was going – on track for a PB, and a big one at that! So I ran hard for the last km, with a PB in sight, and as I ran towards the finish line, Alan McCloskey was behind me yelling, “Shoulders back, up, up, UP!” Crossed the line in 20:28, a PB by 27 seconds. I was absolutely astonished by this, as I was only telling Pip, my training buddy, 2 days earlier, that I could not envisage doing a 5km PB for quite awhile, as my focus at this point is on the Marathon. Newcastle Cross-Country also had it’s first meet on Saturday afternoon, I didn’t go because I had to play hockey but I look forward to going to one of their events soon. An extra hour of sleep on Saturday night for the end of daylight savings meant everyone at the start line of the Hill to Harbour on Sunday should have been well rested. The results are not published online until tomorrow, but I know a lot of people did PB’s in both the half marathon and the 10km, Well done to everyone who ran. It was so great seeing so much pink on the course, and seeing Dave Robertson run the 10km naked from the knees down… Thats right, no shoes. Someone buy the poor man a pair of shoes! I loved all the support on the sidelines, so thankyou to everybody who cheered! I ran the 10km event because I am tapering for the Canberra Marathon next weekend, but look forward to running again next year. Love the page – you should tell more people about your blog its really good imo. Keep up the good work!